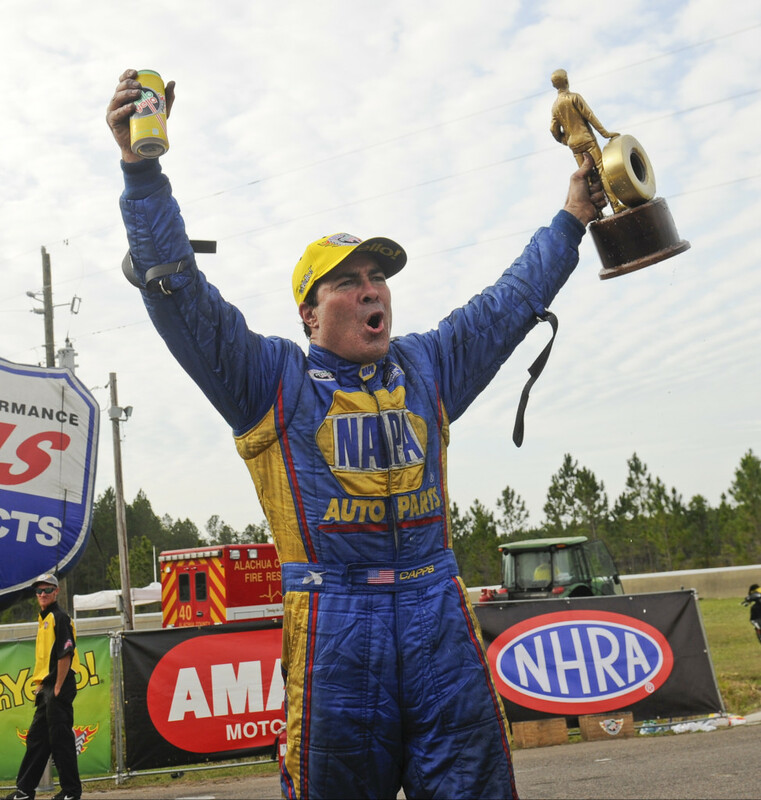 Spencer Massey and Ron Capps gave their boss, Don Schumacher, an injection of the best medicine ever by winning the nitro categories, respectively, at the Amalie Oil Gatornationals. Schumacher made it to his first race of the season after undergoing cancer treatments. He was welcomed back with open arms by his teams and fellow competitors. In the other classes, Greg Anderson ended a 60-race Pro Stock losing streak, and Karen Stoffer came back to win the Pro Stock Motorcycle season opener. The normal jovial Spencer Massey got his chance to really deliver for DSR and Don Schumacher, personally, this weekend. 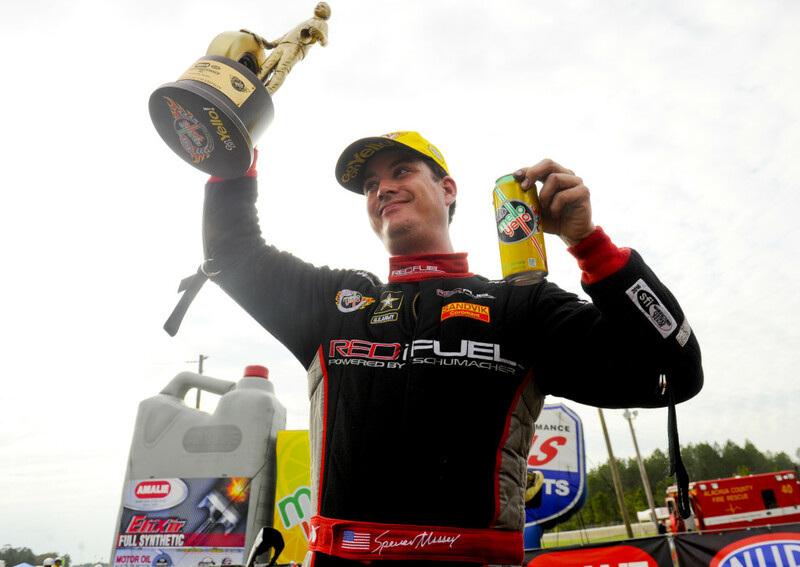 The Gatornationals is a big race, and this was Massey’s first win at the stoic Auto-Plus Raceway. To be able to hand Schumacher his Wally after successful cancer surgery and treatment that ended on Feb. 20, was just what the doctor ordered for both owner and driver. 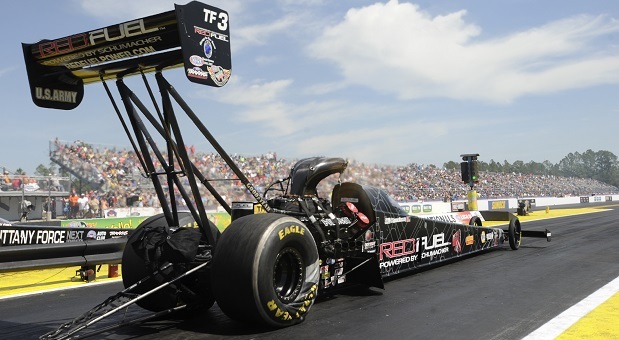 The Red Fuel DSR team, led by crew chiefs Todd Okuhara and Phil Shuler ,showcased a strong performance all throughout the warm, sunny weekend en route to Massey’s 18th career Top Fuel title, tying him with Darrell Gwynn and Shirley Muldowney. After qualifying second with a 3.793-second lap at a track record 329.02 mph, Massey and team improved in the opening round of Sunday’s eliminations with a 3.768-second lap at 329 mph. But it wasn’t an entirely easy day for the Red Fuel team. There were problems in the DSR pits between rounds that had to be addressed. “We went to go warm the car up before that second round and we found that we had some issues in the clutch,” Spencer said. “We ended up getting Matt Hagan’s Mopar Express Lane team over and we all work well as a team. That’s how all of Don Schumacher Racing works, if anyone has a problem there is going to be other teams coming over to help. 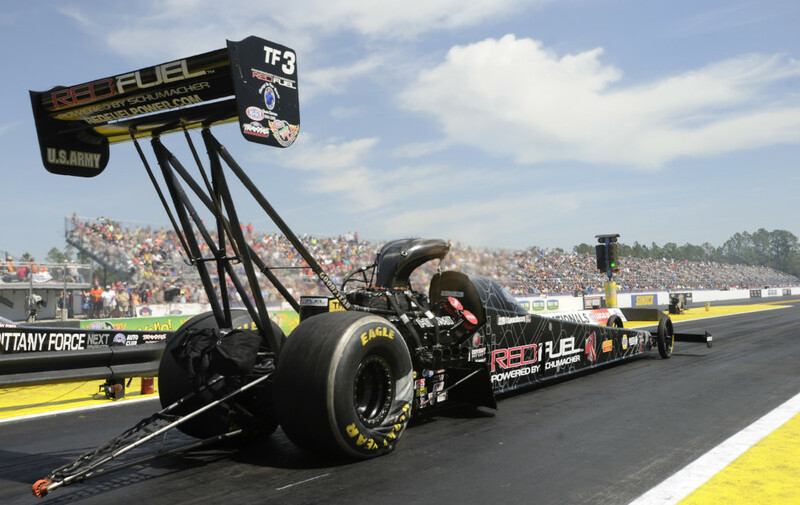 Spencer faced DSR teammate Tony Schumacher in the final round and now has a 4-1 record against the eight-time champ in final round appearances. He used a .020 reaction-time against Schumacher to get a holeshot win over the defending series champion. The other big news of the weekend was three-time Top Fuel champion Larry Dixon’s spectacular crash in Saturday’s qualifying round. The Bob Vandergriff Top Fueler literally split in half in front of the foot box, and Dixon was very fortunate to be able to walk away from the accident. After going airborne, and propelling his car lengthwise nearly 700 feet in the air, it went out of control near the finish line crashing back on the ground violently before stopping. The entire crowd let out a sigh of relief when Dixon emerged unharmed. Don Schumacher Racing’s NAPA Funny Car personified the definition of “team” as Ron Capps took Sunday’s NHRA Gatornationals title to complete the one-two punch of wins for DSR. Crew chief Rahn Tobler has been making major changes to the NAPA 2015 Dodge Charger R/T’s clutch system while adjusting to an all-new carbon fiber body; and Capps’ exceptional reactions at the starting line combined to move the NAPA team up to second place in points. It also helped that Ron’s better reaction times on two of Sunday’s four runs allowed the NAPA team to win those races with slightly slower elapsed times. Capps was first to leave the line in the first round against Courtney Force then eliminated No. 1 qualifier Cruz Pedregon in the quarterfinals. In the semis, Capps was first to leave again and beat a slightly quicker Tim Wilkerson by a few inches. 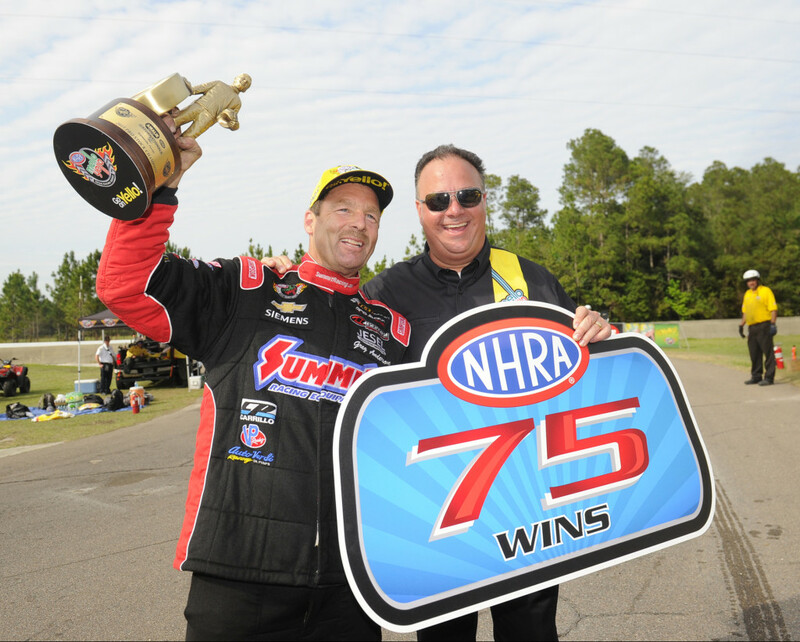 In the championship round, he ended rookie John Hale’s hopes of getting his first NHRA Wally trophy. 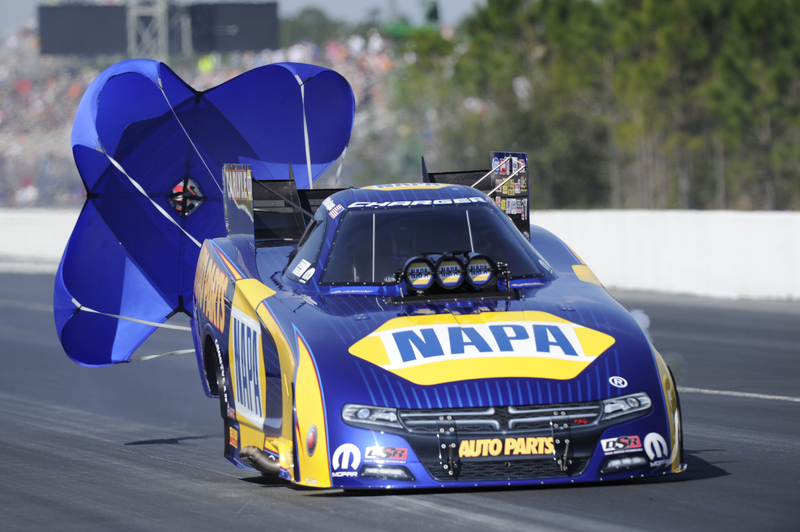 The NAPA team has advanced to two final rounds in this season’s first three events. The Gatornationals win was Capp’s 44th career event title (one Top Fuel title), passing Tony Pedregon’s 43. In the season-opener at Pomona, Calif., Ron lost to DSR teammate and points leader Matt Hagan, who gave the new 2015 Dodge Charger R/T its first NHRA title. 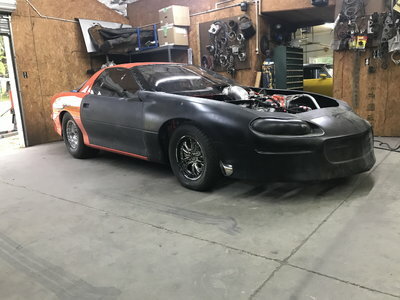 “The Dodge people worked real hard on this new car, and while I was happy for Matt when he won at Pomona and Phoenix, I had wanted to get them the first win with the new body,” Ron said. Ron’s win helped mark the 43rd time DSR doubled up at an event. It was a long time coming, but Summit Racing Pro Stock driver Greg Anderson finally hit a milestone that has been just out of reach for nearly three years. 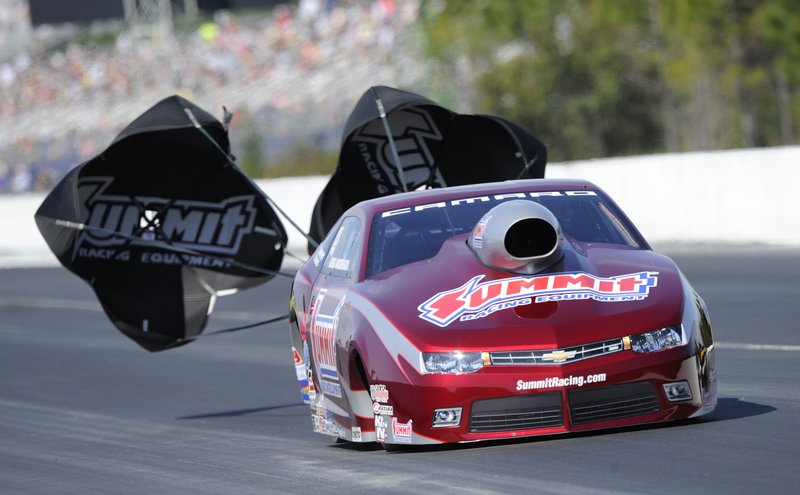 Piloting a new-to-the-team Summit Racing Chevrolet Camaro, Anderson reached the winner’s circle and turned the ticker on the 75th national event win of his career in the 23rd all-Summit Racing final round. Anderson had a good vibe entering the event, debuting the red Summit Racing Camaro – a car purchased over the winter from another competitor who had put very few miles on it. The last time Anderson brought out a new/used car, he won. That victory, also in a red car, was 60 races ago and the most recent win on his scorecard. “This is the second time in our career we’ve bought a used car from another racer, completely refurbished it, put a shiny paint job on it, and it’s gone right to victory circle,” said Anderson, who beat Summit Racing teammate Jason Line in the final round with a 6.538-second pass at 213.43 mph to his familiar foe’s time of 6.554 seconds, 212.96 mph. Anderson, whose most recent win before the Gainesville victory was at the 2012 Summernationals in Englishtown had much to celebrate this weekend in Gainesville. On his way to the final – the 117th of his career – Anderson halted Larry Morgan and Shane Gray before clocking a 6.560 at 213.67 mph that would go down as top speed of the meet to put No. 1 qualifier Chris McGaha on the trailer. The semifinals triumph over a tire-shaking McGaha set up the all-Team Summit final, the first since the race in Seattle in 2014 in which Line took the trophy home. Anderson and Line left with just .005-second between them, Line launching first with a .020 to Anderson’s .025-second reaction time. Anderson efficiently made up the difference and tripped the last timer with a 6.538 second pass at another big speed of 213.43 to Line’s 6.554, 212.96. Anderson is now 14-9 in final rounds with Line. 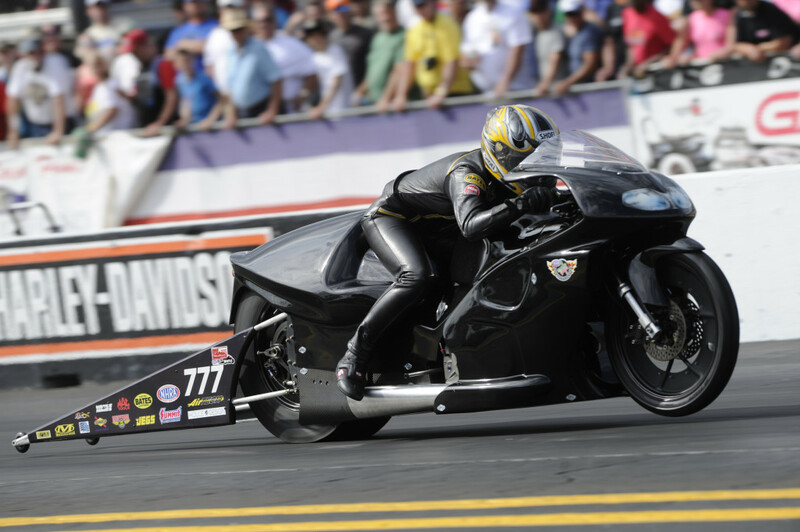 In Pro Stock Motorcycle, Karen Stoffer defeated three-time world champ Eddie Krawiec in the final with a run of 6.900 seconds at 195.11 on her Suzuki to claim her second victory at this event. Appearing in her first race since Indianapolis in 2013, Stoffer defeated Steve Johnson, Angie Smith, and Shawn Gann moving on to the final. The win was Stoffer’s first since Denver in 2011 and her seventh overall. The NHRA Mello Yello Drag Racing Series heads to Charlotte, N.C. for the sixth annual NHRA Four-Wide Nationals, March 27 – 29, at zMAX Dragway.